Bollywood's rumoured love birds, Alia Bhatt and Ranbir Kapoor are talk of the town off late. The two have also been dropping subtle hints about their relationship. Today, Dharma's official Instagram handle shared a cute snap of Ranbir and Alia. 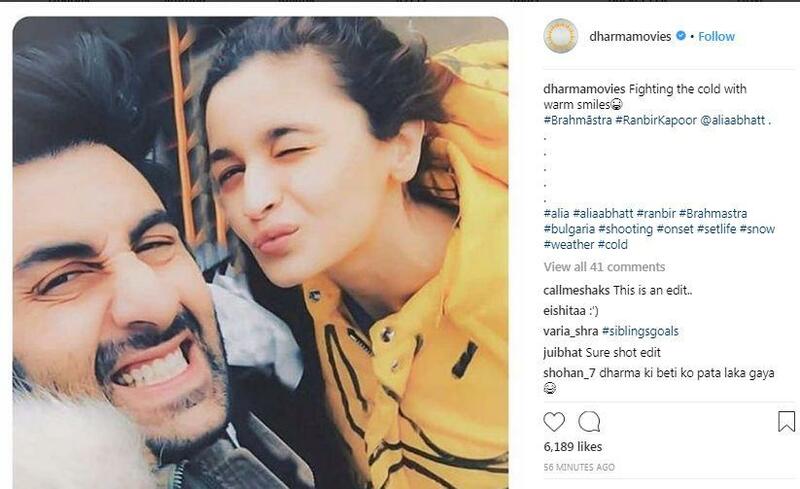 In the picture, Ranbir can be seen flashing his infectious smile while Alia shows off her famous pout on the sets of their upcoming flick, 'Brahamastra' in Bulgaria. The two look just perfect with each other. Directed by Ayan Mukerji, 'Brahamastra' also star Amitabh Bachchan, Mouni Roy, and Tollywood star Nagarjuna.